In John Lessore’s Sunday, lunch is nearly ready. There’s a table laid before us, with crockery and cutlery and wine. Two kids read or scribble on something at one end of the table. Another child has her back to us, waiting. A woman is about to place the roast joint of meat on the table, while another is poised with a pile of plates. Beyond, a figure in what could be the kitchen sees to a domestic detail. It’s an everyday scene, familiar and ordinary. You can almost smell the fragrant aromas; perhaps the radio is mumbling softly in the background. Who are these people? There’s an implied relationship between them, since they’re about to eat together – but nothing’s too explicit. We don’t know how the two women are connected. Are they sisters? It’s also unclear whether all the children are closely related. It doesn’t really matter. For this short time, these people have come together to share a meal. The muted colours in this painting – brown, aubergine, wine red, deep pink, ochre, dark olive green – are sensual, earthy and warm, creating an inviting interior scene. From the left and from beyond light suffuses the scene with a cool serenity. John Lessore has beautifully captured a moment in time. But he’s done it with compassion rather than sentimentality. It’s realistic enough, but the artist’s imagination has transformed the everyday into something that demands our attention. Our lives consist of millions of such episodes stitched together. If we don’t have eyes to see, or are too preoccupied with our pasts or futures, we miss their beauty and lose their meaning. The people in the painting don’t look at us, they look at each other or at what they’re doing. 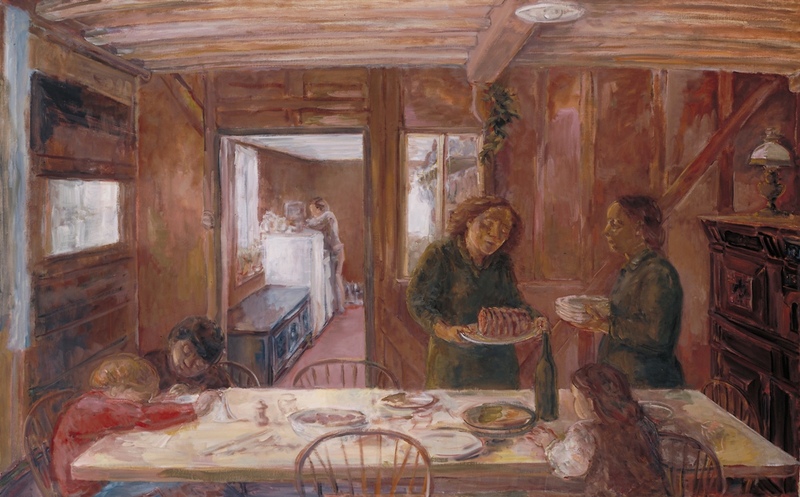 The lowered eyes of the family, children included, create a sense of stillness, a sort of absorption in the moment, which gives the painting a contemplative quality. Time’s flow has been stemmed. We measure time with days of the week and Sundays are different for many people, whether they’re religious or not. Sundays can have that sense of time slowing, of being set apart. Today is the first Sunday of Advent, a period of time that’s also distinctive, set aside. We can use today to reflect and prepare for Christmas, to start to think about the birth of Jesus, God made man. A man whose belly needed filling, who made things of wood, walked about, cried, laughed, fried fish and drank wine. At Advent we can make space to think about the whole story. Not just the arrival of a baby, but where that baby’s life was heading. We can’t take in the images of cribs, cattle and kings without knowing that the man this baby became ended up on a cross. And over a meal with friends he said he would soon be gone, asking them to remember him whenever they broke bread together. Sunday was not painted with any religious intention. But the repeated act of sharing a meal, often taken for granted, can be sacramental and holy. May this Advent be a time when you can slow down, have eyes to see, and take some time to contemplate a story. A story that’s retold every year, but is still astonishing. One that’s still unfolding, and one in which you also have a seat at the table. John Lessore: Sunday, 1985-1989, oil paint on canvas, 153 x 245 cm, © Tate, London 2012. Rachel Giles works at the National Gallery Company, London, as a project editor of exhibition catalogues. After working as Commissioning Editor for Thomas Nelson and a publisher at Longman, she became Head of Publishing at the National Maritime Museum, Greenwich, where she developed their publishing imprint. In 2009 she took an MA in Professional Writing at London Metropolitan University. She now combines work at the National Gallery Company with freelance writing on culture for the London Institute of Contemporary Christianity, Third Way magazine, Church Times, and The Londonist, as well as lecturing on publishing for Christie’s Education and Kingston University.